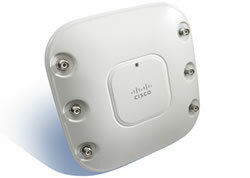 Looking for a vendor who will buy your Used Cisco Aironet 3500 Series Wireless Access Points? We can help! NetEquity.com provides buyback and/or trade-in's on Used or Excess Cisco Aironet 3500 wireless access points. If you have recently gone through a wireless network upgrade or switched to a new Wireless network hardware vendor and have unwanted Cisco Aironet hardware you no longer need, we'll buy it. To get started, simply contact our buyer agents and request a quote on your excess Cisco Aironet inventory. Cisco Aironet 3500 Series wireless Access Points feature Cisco CleanAir technology, and are the industry's first 802.11n access points to create a self-healing, self-optimizing wireless network. CleanAir technology is a systemwide feature of the Cisco Unified Wireless Network that improves air quality by detecting RF interference that other systems can't recognize, identifying the source, locating it on a map, and then making automatic adjustments to optimize wireless coverage. These innovative access points provide the highest-performance 802.11n connectivity for mission-critical mobility. By intelligently avoiding interference, the 3500 Series offers performance protection for 802.11n networks to help ensure reliable application delivery. NetEquity.com Buys and Sells Cisco Aironet 3500 Series Wireless Networking Equipment. If you are an equipment seller or potential buyer interested in pricing, we can help! Contact us today for a quote. Do you want to Purchase New or Refurbished Cisco Aironet 3500 Series Wireless Access Points? Whether you need (1) wireless access point or (100), NetEquity.com offers competitive discount pricing and fast shipment on New and Refurbished Cisco Aironet 3500 Wireless Access Points including the popular AIR-CAP3502I-A-K9 and AIR-CAP3502E-A-K9 models. If your company is considering an upgrading your existing Cisco Aironet wireless network, contact us today for a trade-in quote on your old equipment. We also provide competitive pricing on New, Used and Refurbished Aironet 3500 Series Wireless Access Points. NetEquity Refurbished Cisco Aironet 3500 Series Wireless Access Points are professionally remanufactured to Grade A Cosmetic Condition, fully tested by Certified Engineers and reset to Factory Default settings. Our Refurbished Cisco Aironet Wireless Access Points include Mounting Hardware and RJ45 patch cables, and are ready to install out of the box. In addition to offering extremely competitive pricing on Refurbished Cisco Aironet Products, we also offer a full 1-Year replacement warranty for End Users on all Refurbished Cisco products. We also maintain a very large standing inventory of the most popular Cisco Aironet Wireless models and accessories, ensuring that we have what you need IN STOCK, with no long lead times. Please note when ordering or requesting Cisco Aironet model pricing: Cisco Aironet "i" type access points (Where you see an "i" in the manufacturer SKU/Part #) include integrated wireless antennas. Cisco Aironet "e" type access points (Where you see an "e" in the manufacturer SKU/Part #) have external antenna connectors. Wireless Antennas for Cisco "e" type access points are not included and must be ordered separately. Consult your sale representative for a recommendation on which antennas to add to your "e" type access points. NetEquity.com wants to buy your used, excess or end-of-life Cisco Aironet 3500 wireless access points. Just finished a wireless network upgrade? We'll buy your old wireless access points. If you are interested in an upgrade from your current Cisco 3500 access points, contact us today to sell, consign or trade your unwanted Cisco Aironet 3500 Series equipment.